Rare atmospheric electrical discharges captured on camera! Rare sky phenomena such as sprites, elves, blue jets and pixies are not well yet understood but since the conception of high-speed/high-res cameras it is beginning to show up more and more. 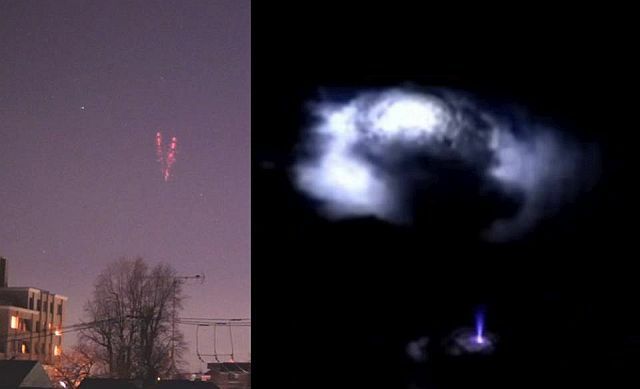 Like sprites, elves or pixies; these are large-scale electrical discharges that occur high above thunderstorm clouds, or cumulonimbus, giving rise to a quite varied range of visual shapes flickering in the night sky. They are triggered by the discharges of positive lightning between an underlying thundercloud and the ground. Also elusive and poorly understood is a blue jet lightning. Blue jets are difficult to study because they are rare, unpredictable and last for only fractions of a second. They form high up in the atmosphere and can stretch for tens of kilometers into the stratosphere. A blue jet shoots upwards from the tops of thunderstorms towards space, has been captured on film in unprecedented detail by astronauts at the International Space Station.